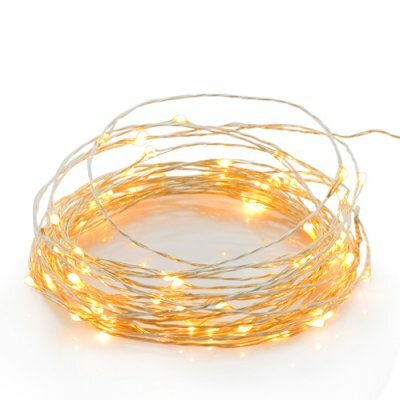 Successfully Added Waterproof Bright Fairy LED Decorative Lights (6.8 Meters) to your Shopping Cart. These bright fairly LED lights are designed elegantly to provide a beautiful luminous lighting environment that can make your building, window display, or landscaping plants and trees glow with a pleasant warm white color light. These fairly LED lights stay running cool, and produces no heat risk what-so-ever. Witness amazing brightness and zero heat risk with these 71 LED's and make great use of the extremely thin and durable copper wire that lets you shape these LED Fairy Lights into any shape or sign that you desire. These waterproof LED Fairy Lights are covered and protected in transparent silicon gel which allows for a 360 degree lighting coverage while providing a nice uniform glow of light. Having an extremely well illuminated landscape will make your arrival home after a long day of work all the more pleasant, and will definitely make your neighbors and guest fully appreciate your exterior decorations. It’s not just about exterior though, you can also use these great warm white LED light strings indoors too. Whether you want to outline a window, statue, mantle, or banister, these lights will do a fantastic job of allowing you to be creative with your indoor lighting decorations. Flexible, bright, easy to install, and fun, no wonder these LED Fairy Lights are often considered the best consumer edition LED string lights you can find on the market today. Let your exterior and interior spaces shine and lead the way on to the new season with these exceptional fairy lights that are available at an unbeatable factory direct wholesale price from us to you. Click "add to cart" and we will express ship them out to you today!